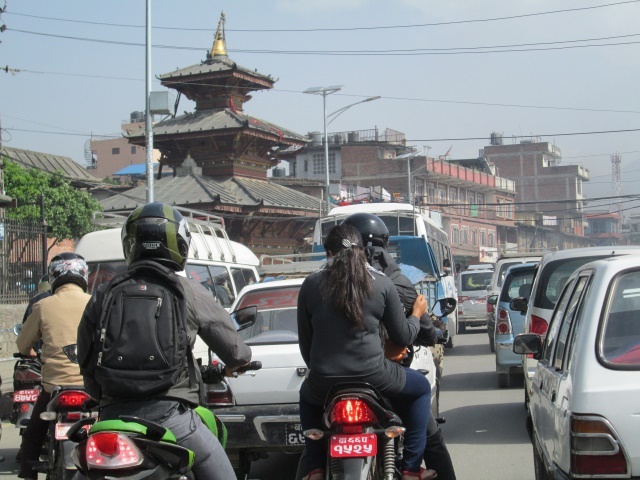 Kathmandu, noisy, dusty and exciting – Will it ever change? The next morning Geljen picked me up early and we planned to catch the 7:00AM flight to Lukla. 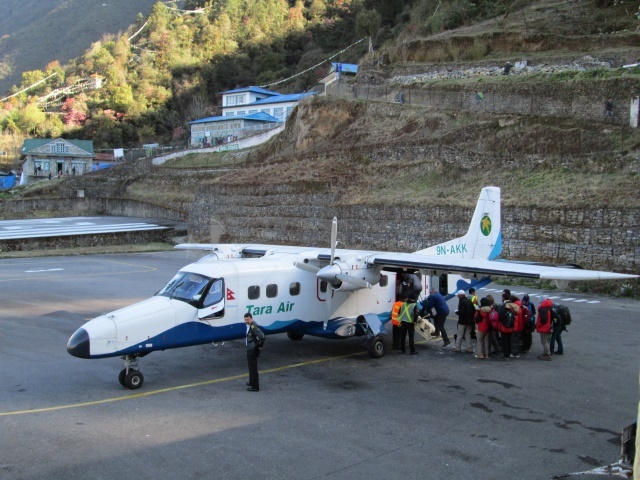 Once at the Kathmandu Domestic Airport, we learned that the plan will be late by about two hours because of bad weather in Lukla. Being a pilot myself, I was waiting with mixed feelings for this flight since I learned that it is one of the ten most challenging airports in the world to land. However, the last accident was years back and I was amazed how smoothly the pilots landed the Twin Otter. As I know from my Antarctica experience and other remote places in the world, this is just a great plane when it comes to difficult terrain. 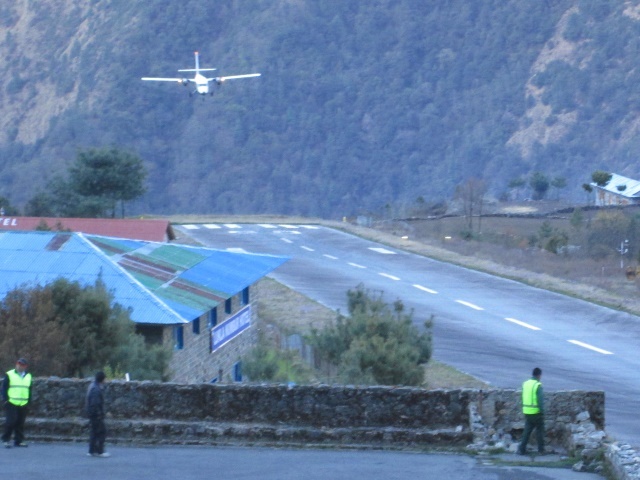 Even Take Off is exciting – As long as you like a downhill runway..
Lukla Airport tower with the Luka village in the back – It is a hilly place. Once I had picked up my heavy backpack I met the first time Lhakpa Nuru Sherpa, the man who will be my guide and climbing partner during the next seven weeks or so. 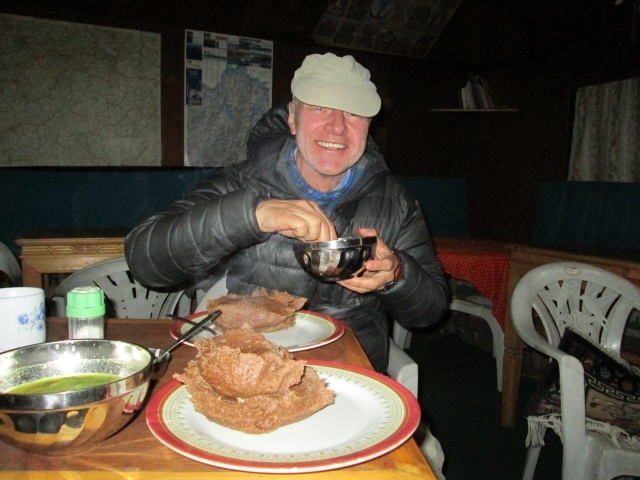 In fact, he will be the Sherpa who will support me on my 2015 Everest quest. 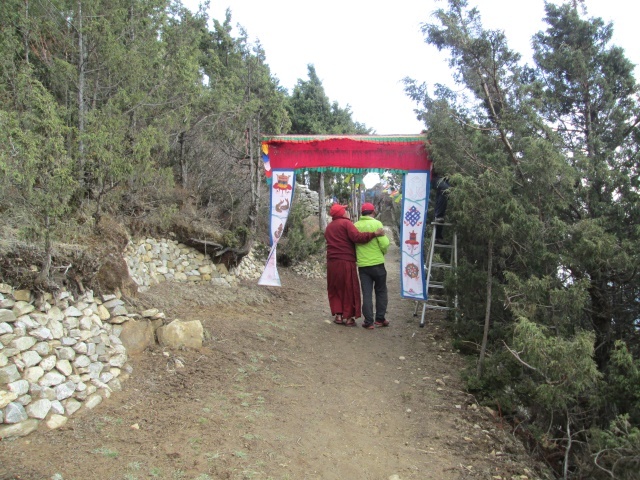 It was a warm welcome and I immediately felt very comfortable with him and from this moment on I got even more excited for my long journey to Chomolungma, “Mother Goddess of the Universe”, how Mount Everest is called in Tibet. 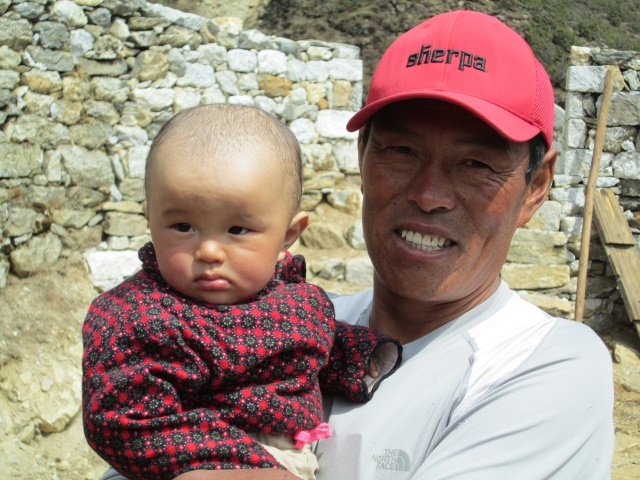 Lhakpa Nuru Sherpa – A wonderful person to be with in the deep valleys and high mountains of the Himalayas. During the next twelve days I spent every day with Lhakpa Nuru and I really felt that I had found a wonderful and warm person which I respect deeply for everything he has done in his life. It was never easy for him. 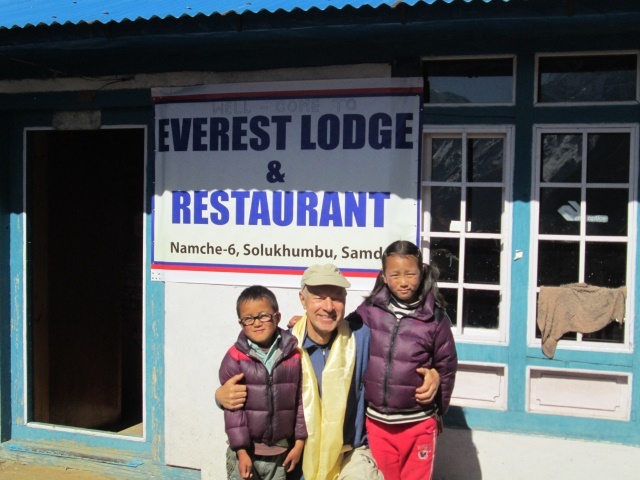 He grew up in Thame, a Sherpa village at 3,800m/8,664ft and lost his father when he was only five years old. 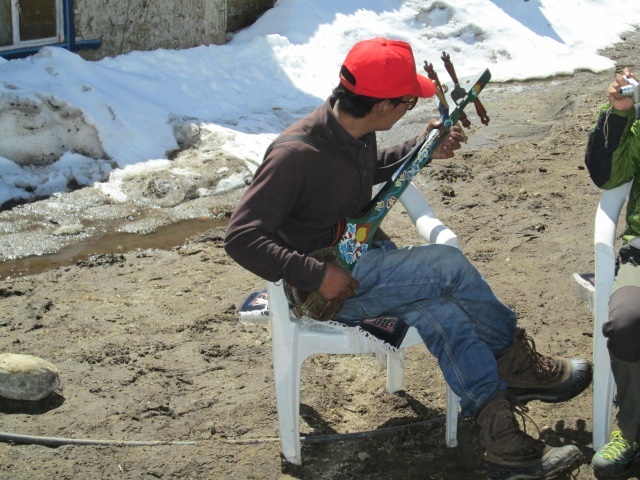 From this moment on he had to work hard, help his family with the Yaks and the Zopkioks (the Himalyan Oxes) so that they had a modest income. 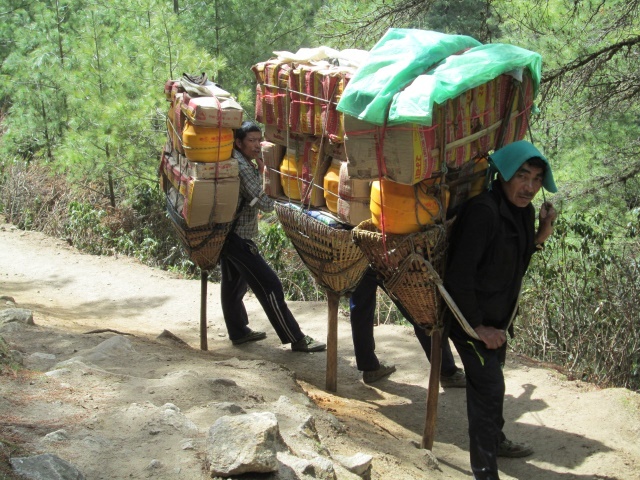 Fifteen years old he started as a porter carrying heavy loads from Jiri and Lukla to Namche Bazar, in the Khumbu valleys. These were extreme long distances and at times very steep trails. 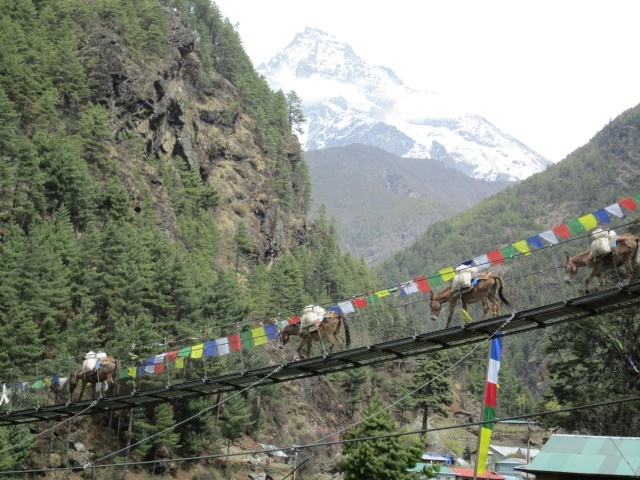 With 24 he carried over 30kg across the famous and often feared Khumbu Ice Falls on the way up to Mount Everest. 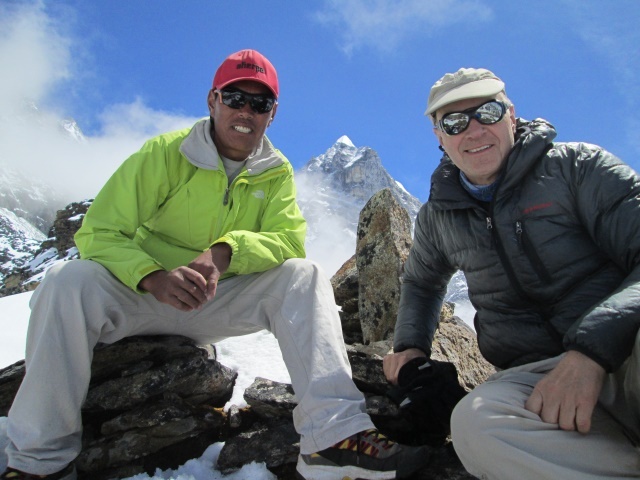 He has summited Mount Everest the first time as a Climbing Sherpa when he was 27 years old and meanwhile has been on the “Top of the World” 14 times (!!!). 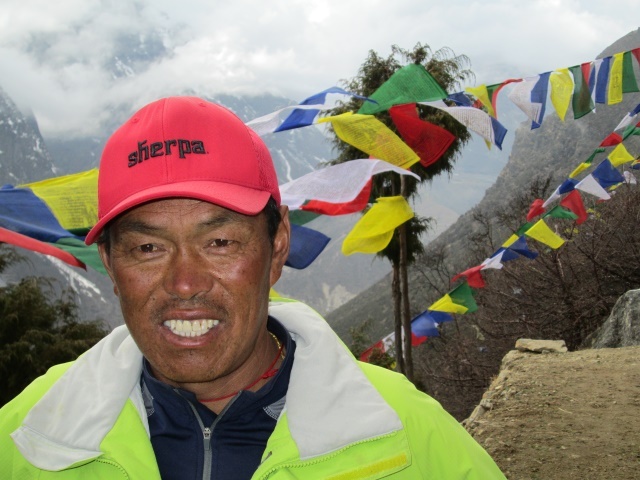 Besides Everest he has climbed other famous 8,000m peaks such as Cho Oyu, Shishapangma, Makalu, Annapurna and many more. Lhakpa is very kind, modest, honest and extremely reliable person. I am so thankful that I met him and that especially that I was able to spend time with him in his home village and in the valley he grew up. 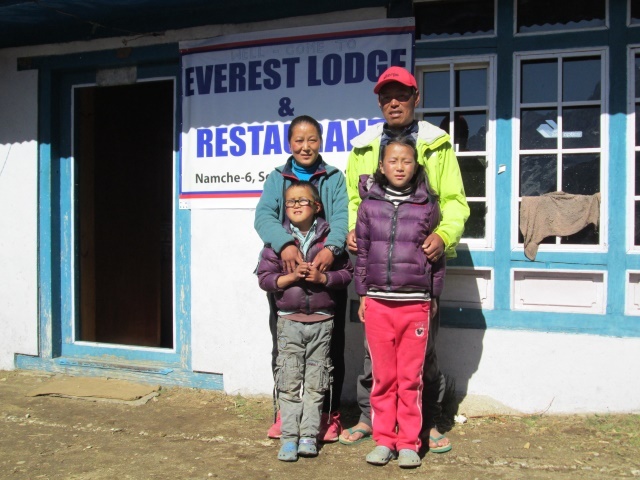 I also had a chance to meet his wonderful wife Jangmu Sherpa and his two lovely children Lhakpa Kiki Sherpa, his ten year old daughter, and Tensing Jangbu Sherpa, his eight year old son. Spending time with all of them and seeing how they live in the high mountain valleys made my think again about the important things in life. 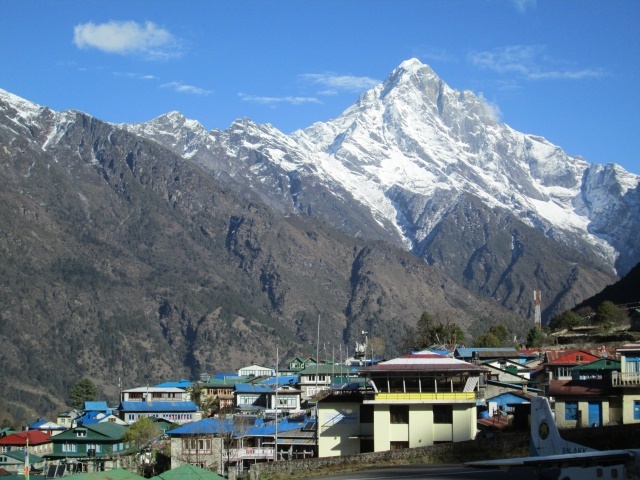 It is definitely not what we think in the Western World… During the time we were together in Khumbu, Lhakpa showed me many beautiful areas and we climbed together some 5,000m/11,400ft peaks, which were actually more “hills” in than peaks. However, the purpose for me was acclimatization and the view was just stunning. Once you are standing at 5,000m/11,400ft and you see all see all these 6,500m/21,500ft and sometimes 8,000m/26,240ft peaks around you, it just makes you speechless. 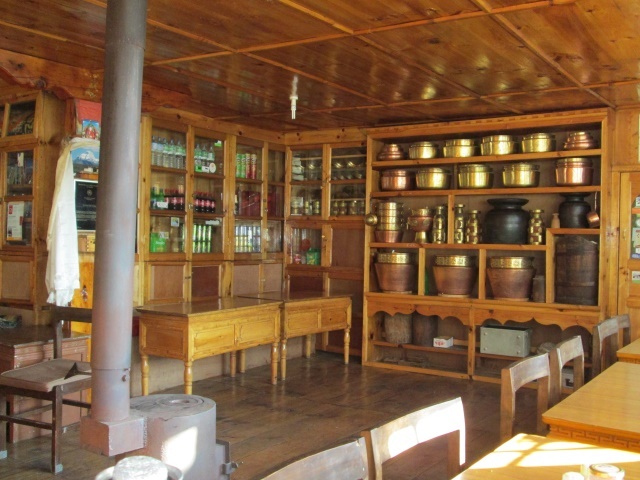 Being from the area, Lhakpa knew many people along the trails and in the villages and very often we were invited into the kitchen of a Sherpa house to drink tea and eat boiled potatoes, a local snack. 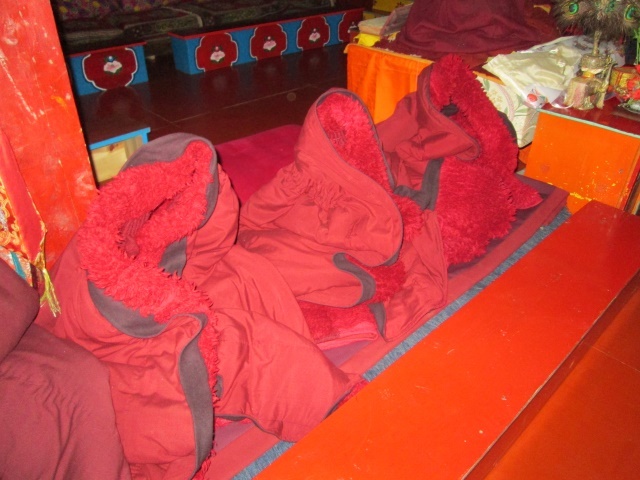 He also knows most of the Lamas and monks in the many monasteries we visited, so Buddhism was always present on all our hikes. And often during this twelve days I experienced what some people call “quiet happiness”. 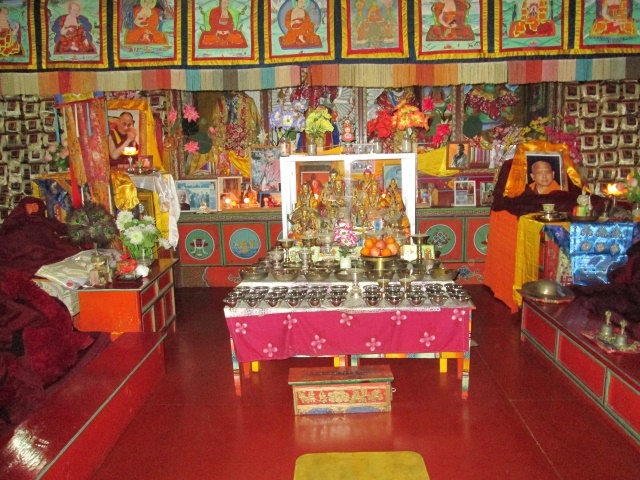 A wonderful experience and all this happens because of the kindness of Lhakpa. I can only be thankful to him for all this! Jangmu Sherpa and Lhakpa Nuru Sherpa with their children Lhakpa Kiki Sherpa and Tensing Jangbu Sherpa – A wonderful family. 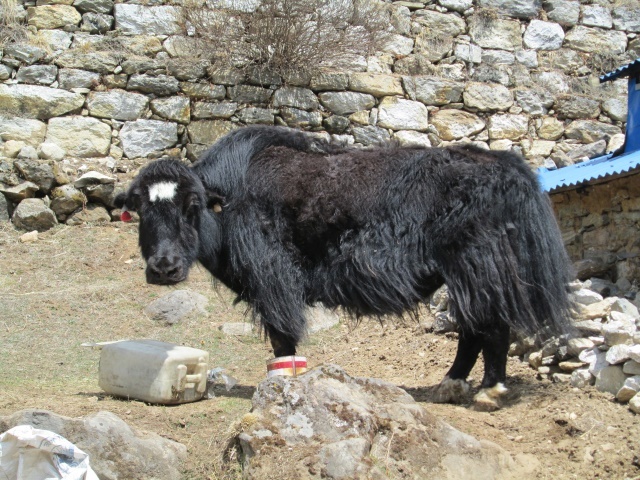 “Uri”, one of Lhakpa’s Yaks. I really like these strong and reliable animals – Or is it the name? 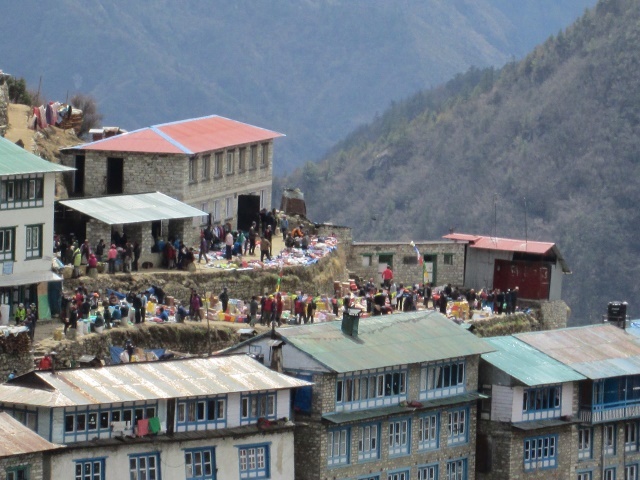 Saying good-bye is always hard – But I am sure that I will come back to the Khumbu and visit all these warm and wonderful people again. 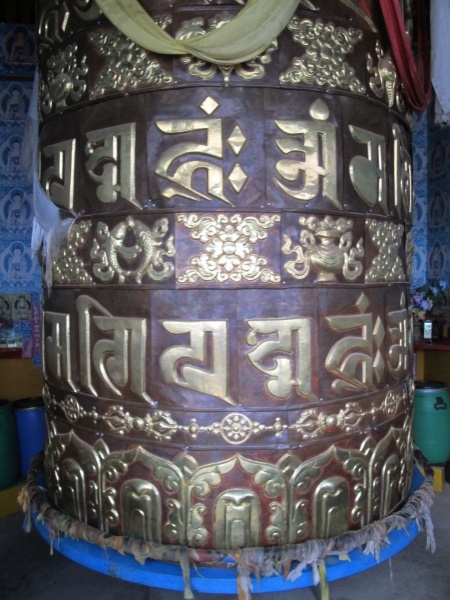 Possibly the most beautiful praying wheel in Khumbu. 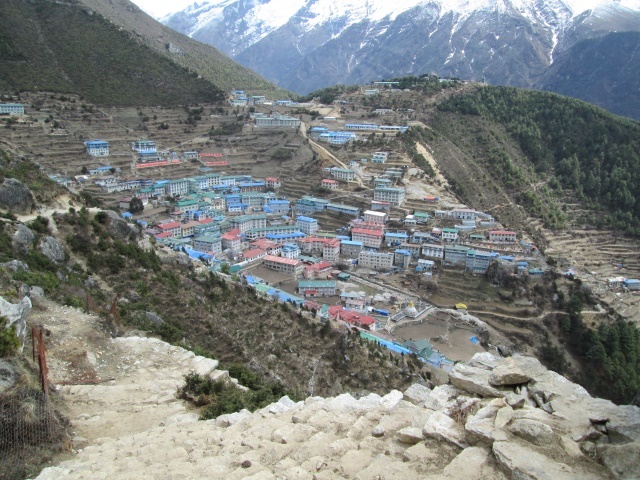 On April 4 we left the higher areas of the Khumbu and hiked down from Namche Bazar to Lukla in less than five hours. 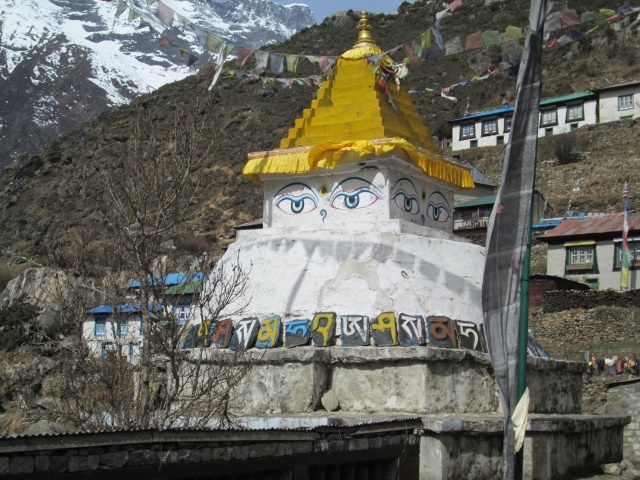 Snow and rain was announced again (which we had seen enough during the last ten days) and we needed good weather for our departure from Lukla airport, or “Tensing-Hillary Airport Lukla”, how it is called now. After his successful summit climb in 1953, Sir Edmund Hillary spent most of his time supporting the Sherpa community in the Khumbu area. With the aid of his foundation he helped to build many schools, hospitals, bridges and also this airport. 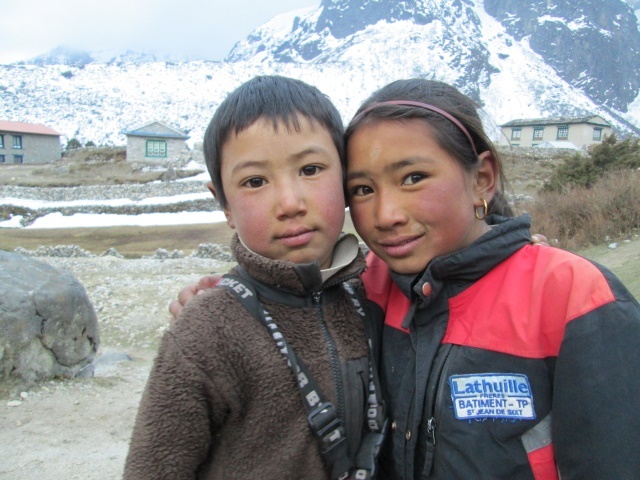 This helped to increase the level of education and the standard of living for this remote mountain community and provided them also with a new source of income: Mountaineering and Tourism. 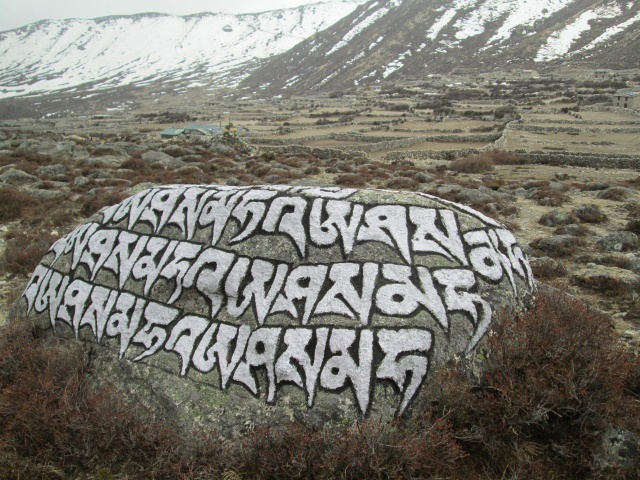 This was especially important since in 1959 the traditional trade routes to Tibet were closed and an important source of income for the Sherpa community, long distance trade, was lost. 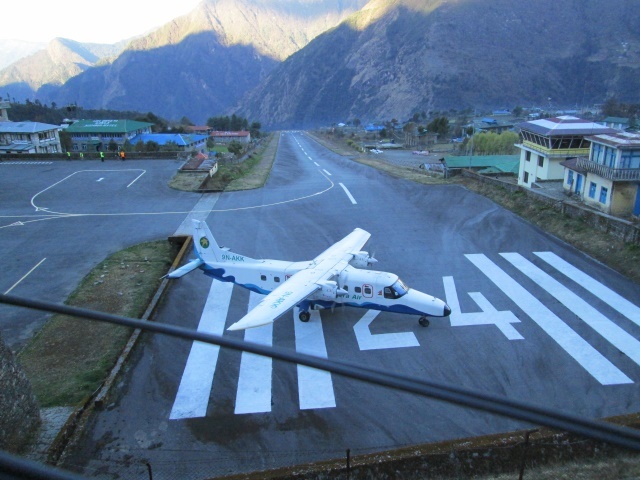 The next morning the weather was good and Lhakpa and I took off into blue sky on this exciting downhill airstrip. On the way to Kathmandu we had a great view of the incredible Himalaya mountain chain with the many high peaks. 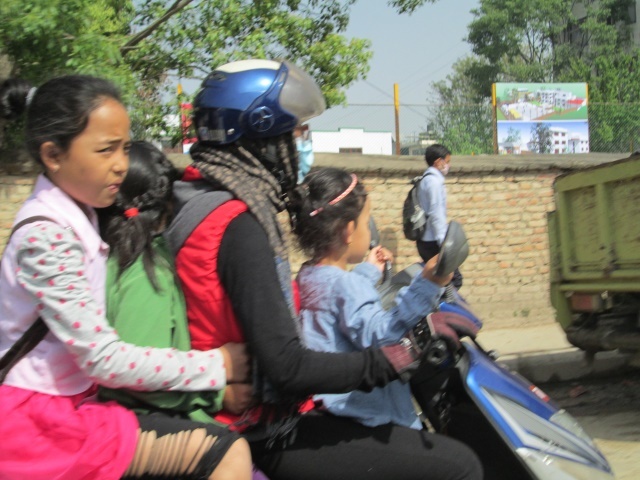 Back in Kathmandu, final shopping, repacking (again) and the last preparation for the Everest journey started. 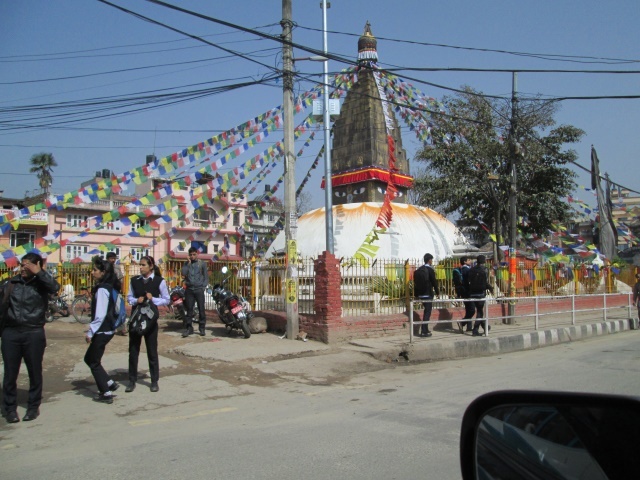 The plan is to cross the border overland from Kodari, in Nepal, to Zhangmu, in Tibet, on April 9 (Though, another strike has started today in Nepal and we will see when we really can leave). Well, all this is part of the journey and I may as well enjoy a few days of warm weather before I move up again into the cold for the next seven weeks or so. The trip to Everest North Side Base Camp will take us about a week and we will join the rest of the Sherpas who have already left Kathmandu (because of the strike) on the way up. I am so thankful that I am allowed to travel with these wonderful people across this unbelievable landscape to the incredible and highly respected Chomolungma, “Mother Goddess of the Universe”. Yes, Life is vibration – We just have to “tune into” the right frequency! 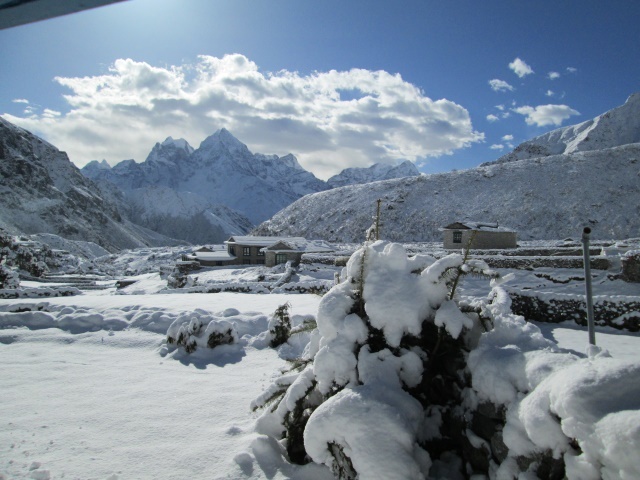 Please find below some last pictures and impressions from my Khumbu journey. Enjoy! 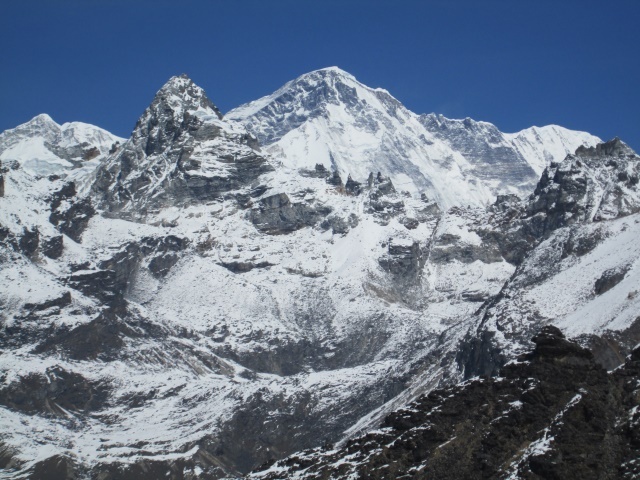 The next update with the beginning of the Everest expedition will follow shortly.